If you’re a high volume concrete products producer, you depend on your batch plant to set the pace. Only one batch plant measures up: BatchMaster from Mixer Systems. BatchMaster is our top-of-the-line plant, capable of producing up to 250 yards per hour. Configure BatchMaster to your exact specifications, beginning with our legendary mixers. Behind every BatchMaster is almost 40 years of experience in batch plant design, manufacturing and construction. No matter what the production challenge, BatchMaster takes charge. Weigh belts or weigh batchers. Add augers, open or enclosed belt conveyors, holding hoppers, gantry buckets, traveling bucket delivery systems and mixer washout systems. Mixer Systems can assemble a total, unified system to provide you with smooth, dependable material flow throughout your entire plant. 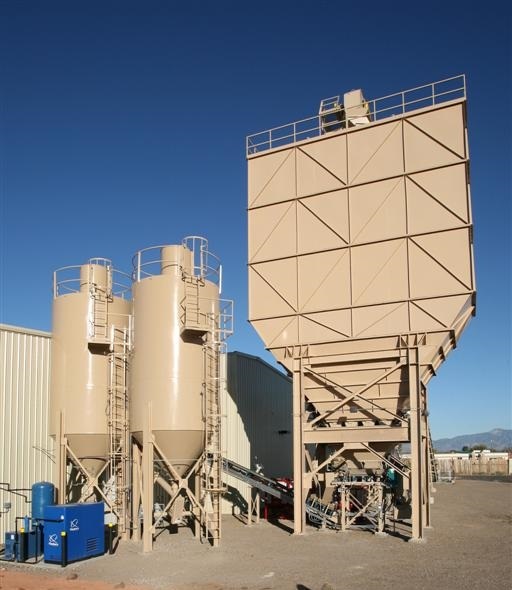 You can choose from cement or fly ash silos up to 1050 barrel/4200 cu. 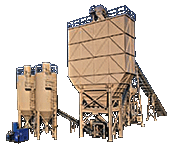 ft. capacity, aggregate bins to 350 tons and both open and enclosed conveyor systems. Weighing accuracy of the aggregates is within +/-2% and cement/water to within +/-1% of the batch size. Our computerized control ensures that all materials are sequenced into the mixer at the appropriate time and in the correct amounts for your mix design every batch. The E-350 offers the highest level of batch plant automation and programmability. Run a high-volume batch plant from start to finish-batching, mixing, moisture control, even automated concrete delivery of different mix designs to multiple locations on demand. The Ag-Flow™ System is an economical way to control those variables and improve performance. A year-round solution, Ag-Flow is easy to install in new or existing plants and can handle up to eight separate aggregate bins.